Every James Bond fan will recognize the lines in this recipe as the first martini Bond ordered in Ian Fleming's 1953 book, "Casino Royale." It is possibly the most famous drink order in history, it's extremely precise, and recreating the Vesper martini at home is easier than you think. This drink is purely fictional, one created by the author in his first book about the now famous British Secret Service agent. It's even become known as the "Bond martini." Of course, as any devotee of the books or movies knows, Bond is very fond of fine cocktails and this was certainly not the last drink in the series. The Vesper martini is interesting because it combines gin and vodka with dry vermouth. It's a very potent mix and Fleming (er, Bond) is very specific about brands for two of the ingredients involved. In a cocktail shaker, combine the ingredients. That recipe is easy enough, though many people prefer to stir it like they do a classic martini. The shake is actually a good thing here because it dilutes the drink, which is very heavy on the alcohol. 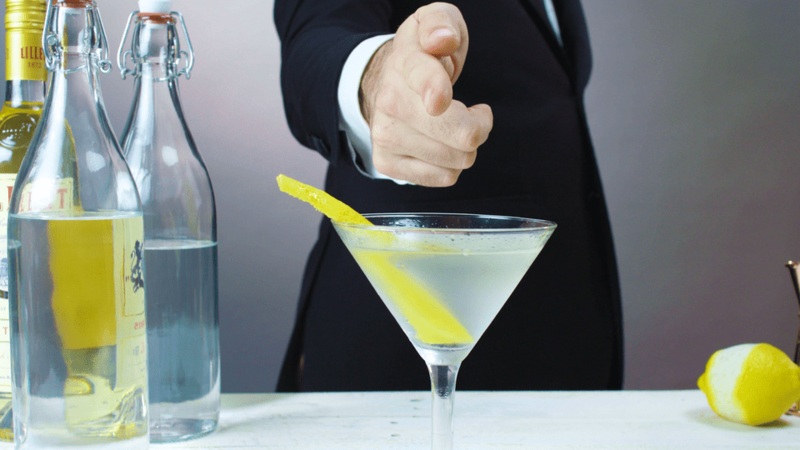 How Strong Is a Vesper Martini? It's said that vodka in the '50s was often bottled at 100 proof and that Gordon's was 94 proof at the time (it's since been reformulated). Factoring those numbers in, the Vesper could easily be a 39 percent ABV (78 proof) cocktail. That's equivalent to a straight shot of most vodkas on the market today. Of course, anytime you have a debate over shaking versus stirring cocktails, one can't help but think of Bond's famous line, "shaken, not stirred." That one first appeared in Fleming's 1956 novel "Diamonds Are Forever." One thing's for sure, Fleming certainly knew his way around great drinks. The Kina Lillet that Bond speaks of can be found today labeled as White or Blanc Lillet (pronounced lee-lay). It's a brand of dry vermouth that has been made in France since the late 1800s. It is often referred to as "the apèritif of Bordeaux." The Gordon's Gin available in the U.S. today is different than that found in the U.K. They're both different than the Gordon's that Fleming knew because the recipe and strength have changed. While Gordon's is a good everyday gin, there are plenty of better options to choose from today. Many people prefer Tanqueray or Beefeater, though some like Plymouth. Pretty much any top-shelf London dry gin will make a nice Vesper. As mentioned, the vodka Bond would have likely drank (had he not been a fictional character, of course) would have been 100 proof. These are not the easiest bottles to find, though brands like Absolut, New Amsterdam, and Svedka are available. If you want an upgrade, don't worry about the strength and pour your favorite premium vodka. Finally, Bond's glassware of choice for the Vesper is a deep Champagne goblet. Many of the cocktail glasses used back in Fleming's time would have held only 3 ounces and, when shaken, the Vesper tops off at almost 5 ounces. It's reasonable to assume that the goblet preference was simply a matter of volume. However, today big martini glasses are very common so you won't find any issues with the majority of modern drinkware options.